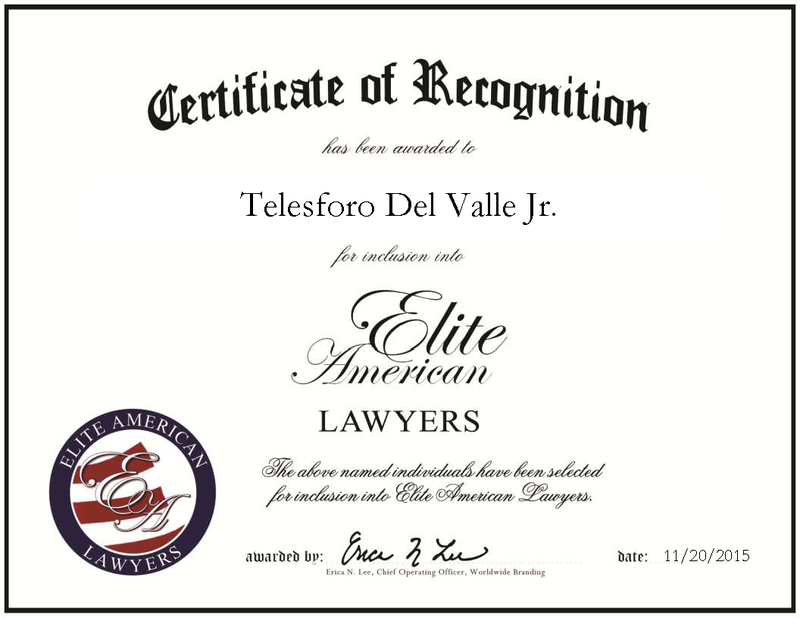 New York, NY, November 20, 2015, Telesforo Del Valle, Attorney, has been recognized by Elite American Lawyers for dedication, achievements and leadership in criminal defense. By representing his clients to the best of his ability, Mr. Del Valle has met with tremendous success over the last three decades. Named one of Martindale-Hubbell’s Top Rated Lawyers in 2014, he offers quality criminal defense legal services in the metro New York area. In his career, Mr. Del Valle served as president of the Hispanic National Bar Association for the New York region, president for the Puerto Rican Bar Association and vice president of the New York State Association of Criminal Defense Lawyers. Mr. Del Valle earned an undergraduate degree at Fordham University, followed by a JD from New York Law School. He specializes in a number of offenses, including assault, battery, criminal negligence, DUI, pubic indecency, fraud and extortion. He represents clients charged with felonies, infractions and misdemeanors. Looking ahead, Mr. Del Valle plans to continue offering top service to clients in New York. Contact Telesforo Del Valle Jr. This entry was posted in Criminal law and tagged criminal defense, criminal negligence, DUI cases, New York, Top Rated Lawyer. Bookmark the permalink.